Potomac River guides are busy. For me, it means ordering my 2019 Skeeter FX20 and 10 foot Power Poles. For long stays on the water with reliable cranking power, DEKA Batteries energize my rig. Capt. John Sisson’s new Ranger is being rigged with HUMMINBIRD electronics, Power Poles and a Mercury outboard. Capt. Michael Hall and Capt. George Martin are going through their rigs to recover from 2018. Capt. Mike’s 2016 Ranger Comanche 521C goes to MARE Marine for a top to bottom check up. He doesn’t neglect his Criswell Chevrolet Suburban either, readying it for long tows. Capt. George’s off-season boat care starts with a deep cleaning, carpet shampoo, and hull and bottom wax job. He replaces or fixes any vessel or equipment issues, including electronics, pumps, switches, and hinges. When the calendar clicked over to 2019, licensing expired. Every POTOMAC guide must keep Red Cross First Aid and CPR current, as well as charter insurance. Enrolling in a random drug-testing program is also required. MD and Potomac River Fisheries Commission Guide license renewals begin. USCG Captains licenses must be current. If not, a four-month process is required. Show time! Guides attend shows to promote sponsors, conduct seminars and book trips. Meeting and greeting local anglers takes a lot of energy, as floor time can be 10 hours straight. Having plenty of brochures and business cards to pass out, along with gear for demonstrations, needs preparation too! Websites and marketing begins now, although it never really ends. Updating email lists brings old clients back! Capt. Mike, a professional bass fisherman and USCG licensed guide, relies on social media to generate business, including posting videos and pictures on his Facebook pages and mikehallfishing.com. Additionally, Capt. George, gmcomaps.com, updates his Google listing, creates new handouts for shows, and schedules seminars. Time to take stock. Hooks, line and sinkers are just a start. Rods and reels need to be repaired or replaced. Lures need new hooks and touch up. Tackle needs to be organized. Unused used last year? Take it out of the box and replace with lures that work. Spinnerbaits and chatterbaits need new skirts. Work with sponsors to restock mainstay lures like Mann’s Baby 1-Minus, MUSTAD hooks, Water Gremlin BullShot weights, Gamma fishing lines, Silver Buddy Lures, Jack’s Juice Bait Spray, Maui Jim sunglasses and TEVA sandals. Capt. Mike provides Lew’ s spinning and baitcasting reels paired with Lew’s and Grandt rods. 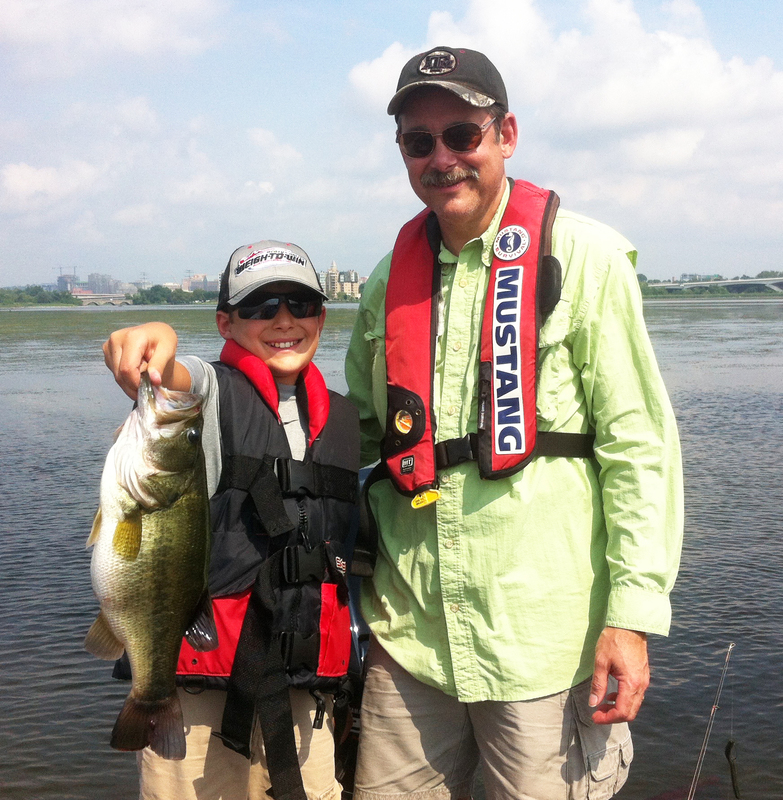 His guide clients use the same gear he uses for professional bass tournaments. Capt. Mike replaces around 6 outfits a year. Capt. George removes the contents of his storage compartments so he doesn’t end up with baits he already has. After taking a complete inventory he seeks show sales within a budget. He looks for deals on what’s new; clients like to see and use the latest baits and or methods they read about. Capt. George cleans, repairs and puts new line on all reels, also checking all rods to make sure they are in good working order. While there’s no substitute for time on the water, staying in shape involves off-season training. For starters, getting up early helps to keep your body clock prepared for the start of the season. Staying fit is essential to fishing their way back into shape. Standing on a trolling motor and helping clients throughout the day requires strength, balance and stamina. Biking, swimming and running are a good start. Weight lifting and balance exercises can maintain the core. In some cases it’s also time for rehab and resting nagging injuries. In my case, off-season knee surgery slowed me down a bit, but my therapist, Emily Beeber at Select Physical Therapy, understood my goals and worked me on the way to recovery over 3 months. From there it was up to me to bump up my regimen to endure another long season. Capt. Mike works out 3 times a week to stay in top physical condition with weightlifting, 200 sit-ups, and dog walking his 85 pound lab 3-8 miles a day. Capt. George visits his dermatologist and eye doctor, taking care of issues before they become BIG problems. His Fit Bit encourages him to walk 3-5 miles a day. Believing healthy legs and back make standing on the front of a bass boat for 4-8 a lot easier, he also keeps up with backstretches. These Captains will be ready for the guiding season in March. When Capitol Catfishing guide Capt. Jason Kintner was asked about his off-season regimen, he replied. “Off-season? I don’t need any stinking off-season! Lol. Your off-season is my prime time.” For those who think guides just take people fishing, there’s a lot more to it. Typically, water temperatures are in the mid to upper 30s. No question Silver Buddys are the first choice to locate and catch fish. The half-ounce silver is best for clear water and for sunny days. Gold works better for stained water or cloudy skies. After that, it’s a mix of spinning reel presentations. For line, spool a Quantum Smoke spinning reel with 10-pound test Gamma Torque braid with 6 pound test Edge fluorocarbon leaders. Shaky head dark colored Mann’s Hardnose Super Finesse worms work on 1/8-14 ounce heads. Cast and shake in place, seldom moving them. Also, Mizmo tubes with 1/8-1/4 insert heads can be worked with a gentle lift and glide presentation. Split shot rigs with 1/8 or 3/16-ounce Water Gremlin BullShot weights, 2/0 Mustad Mega Bite hooks and a Mann’s HardNose Jelly worm. Slow short movements with frequent stops keep the presentation horizontal along flats near drops and down drops. Place weight about 10 inches from the bait. Drop shot in the same areas, shaking in place. Make leaders around 4 inches for drop shots. Spray all soft plastics with garlic Jack’s Juice Bait Spray.